Residents of Moore’s Island view schematics for infrastructure improvements to their island. ABACO, The Bahamas – The Government has begun comprehensive infrastructure upgrade on Moore’s Island. The estimated $5-6 million developments are expected to transform the quaint and tranquil fishing community, replacing 30-year-old infrastructure, and preparing it for the 21st century. Road works, expansion of the airport runway, repairs to the seawall, replacement of water mains, and a new airport terminal and sports facility are among the projects. The Deputy Prime Minister and Minister of Works and Urban Development the Hon. Philip Davis and the Minister of Youth, Sports and Culture, the Hon. Dr. Daniel Johnson led a Community Town Meeting at Greater Bethel Native Baptist Church, Monday, January 25, 2016 to discuss issues affecting the approximately 600 residents there. Also attending the meeting was Edison Key, Member of Parliament for Central and South Abaco; Senator Gary Sawyer; Colin Higgs, Permanent Secretary; Local Government members, senior Government officials; Lavon Harris-Smith, Administrator; and a technical team including representatives from the Ministries of Works and Development and Youth, Sports and Culture, the Departments of Fisheries, Civil Aviation, Lands and Surveys, Water and Sewerage Corporation, and private firms. “This is the first comprehensive, upgrade review that we’ve done of an island community and it says their infrastructure that is 30 years old will come to life and be ready for the 21st century. “This is not about the airport, roads, contractor or the plane. This is about people, people who are just like everyone else in The Bahamas who deserve the best that we can bring to them,” said Minister Johnson. In addition to the infrastructural improvements, discussions were held on issues related to land acquisition. 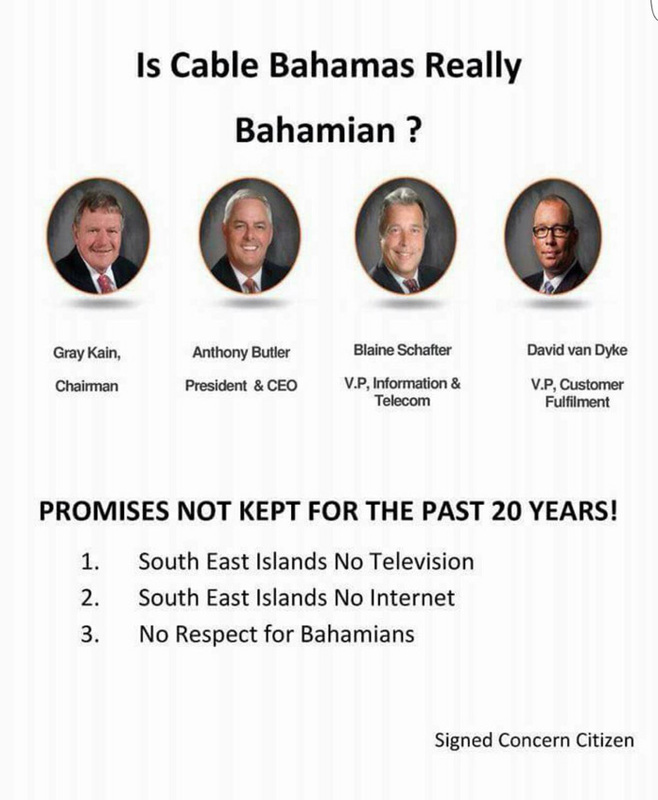 “Throughout the Commonwealth of The Bahamas we have this issue with land ownership. If you have to prove your ownership in accordance with the law it becomes challenging. That has been the problem for residents of Moore’s island from time immemorial. I am happy to say that steps are now being taken to correct those challenges,” the Deputy Prime Minister remarked. Mr. Johnson explained that the process of land acquisition is meant to protect the residents’ interests, their homes, their church and school. “The fundamental basic principal of modern economy and law is land ownership and it has to be demonstrated. The Government is here to protect your interest,” he added. The land has been surveyed and preparations are being made to advertise the Government’s intentions to take ownership. A contract for the first National Sports Academy in The Bahamas was signed on Friday, January 22, and three days later work began on the facility, which is being constructed just two minutes south of the airport. “The facility is being funded through a public, private partnership where we will be doing half of the resources upfront. We’re inviting other private partners who have already invested in to continue to come into complete the project with us,” said Minister Johnson. The complex will include a soccer pit, dormitories, and a track and field. Over five miles of road are set to be repaired. A contract was previously signed for the road works but due to “challenges” encountered, work was discontinued. The road works are expected to be completed in one year. “What we have designed and will deliver will be high quality that will last for the next 25 years. We are looking at the whole island, carrying out works that will last for a long time,” said Leyton Rahman, chief civil engineer. Plans are in progress to construct a new terminal building, extend the ramp area and the runway from 3,100 feet to 4,100 feet. Designs for the terminal include x-ray screening, space for 50 persons in the departure lounge, government agencies, restroom and deli facilities, ticketing areas, baggage screening area and more. Thirty-year-old water lines throughout the island will be replaced with up-to-date, modern infrastructure. “The lines under the roads will be upgraded and modernized. We will be putting in the latest type of lines that are used throughout The Bahamas. As you are building the roads the lines will be replaced. 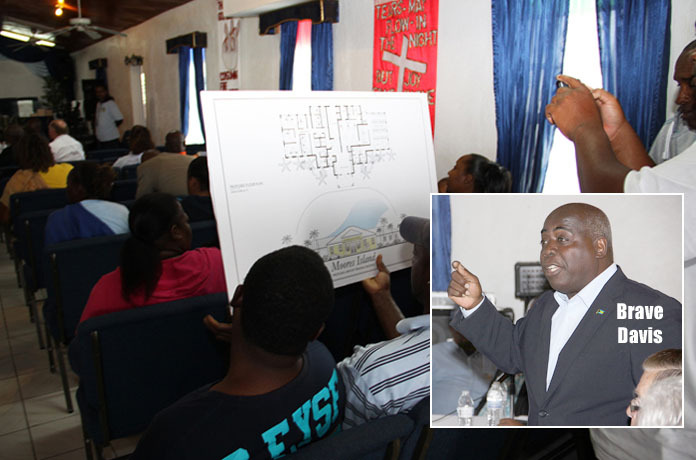 We will minimize the disruption to residents,” said Cyprian Gibson, Assistant General Manager. The Hon. Daniel Johnson, Minister of Youth, Sports and Culture (centre) and the Hon. 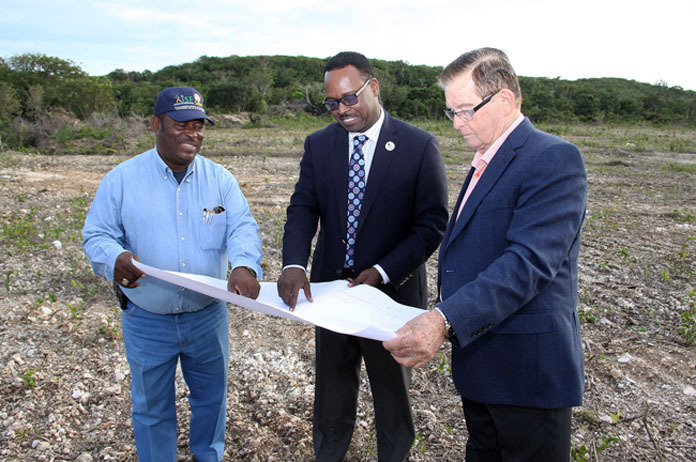 Edison Key, MP for Central and South Abaco look over plans for the Sporting Complex underway in Moore’s Island.